Rockford, Ill. – In the team’s first ever appearance in the Colonial Cup Finals, the Rockford IceHogs used a goal from Matt Gens 4:44 into overtime to take a 3-2 win over the Kalamazoo Wings at the MetroCentre (now BMO Harris Bank Center). The IceHogs now lead the series 1-0. A photo gallery from the contest is available here. The game-winning tally was set up by a too many men on the ice penalty assessed against the Wings at 3:04 of the sudden-death frame. Nathan Lutz moved the puck to Jason Notermann, who found Gens for the strike to end the contest. Rockford settled into the game with a pair of tallies in the second period to open up a 2-0 lead. Bruce Watson connected at 2:13 with assists from Corey Hessler and Bryce Cockburn. Chaz Johnson then increased the lead 2-0 when he capitalized off a chance set up by Benoit Doucet, flipping the puck past goaltender Ryan Nie just past the midway point of the period. Rockford dominated the second stanza, outshooting Kalamazoo 20-7 during the 20-minute session. A penalty in the third allowed the Wings to close the gap. With Notermann in the box due to a high-sticking infraction, Glenn Detulleo made use of the man-advantage with a drive past Frederic Cloutier at 9:57. A little over four minutes later, Nick Bootland evened the game at 2-2 to force the contest into overtime. 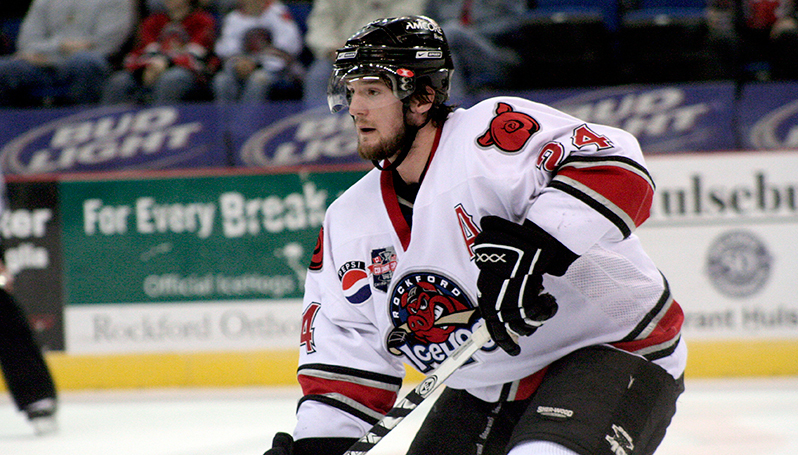 The IceHogs outshot Kalamazoo 41-25, including 5-1 in overtime, in the win. Kalamazoo was led offensively by Bootland (1G, 1A) and Kory Karlander (0G, 2A).